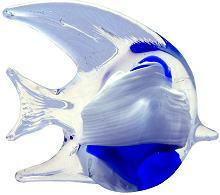 Blue and White Murano style, hand crafted, colorful Angel Fish art glass sculptures. 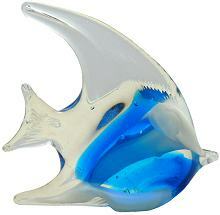 These Tropical fish sculptures have solid blue and white swaths of color within a sparkling clear glass base. Each piece is hand made with unique markings. 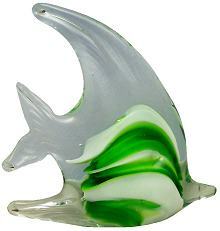 Green and White Murano style, hand crafted, colorful Angel Fish art glass sculptures. These Tropical fish sculptures have solid green and white swaths of color within a sparkling clear glass base. Each piece is hand made with unique markings. 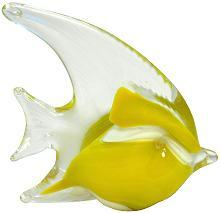 Yellow and White Murano style, hand crafted, colorful Angel Fish art glass sculptures. These Tropical fish sculptures have solid yellow and white swaths of color within a sparkling clear glass base. Each piece is hand made with unique markings. This 3 3/8" round, portable 3 color LED light stand has a satin Silver Base, a flat mirror top with 3 extra bright LED lights in red, blue and yellow that change randomly with a transition of three twinkling lights alternating to two and one color light and so on. There is an on-off switch on the side. Use 3 AA batteries for up to 48 hours continuous use. Batteries are not included. Aqua and White Murano style, hand crafted, colorful Angel Fish art glass sculptures. These Tropical fish sculptures have solid aqua and white swaths of color within a sparkling clear glass base. Each piece is hand made with unique markings. 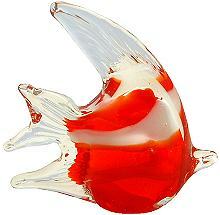 Red and White Murano style, hand crafted, colorful Angel Fish art glass sculptures. These Tropical fish sculptures have solid red and white swaths of color within a sparkling clear glass base. Each piece is hand made with unique markings. 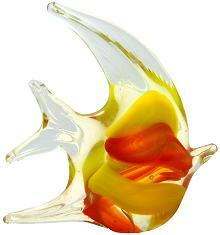 Yellow and Orange Murano style, hand crafted, colorful Angel Fish art glass sculptures. These Tropical fish sculptures have solid red, orange and white swaths of color within a sparkling clear glass base. Each piece is hand made with unique markings. Purple and White Murano style, hand crafted, colorful Angel Fish art glass sculptures. 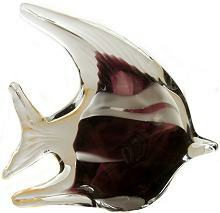 These Tropical fish sculptures have solid purple and white swaths of color within a sparkling clear glass base. Each piece is hand made with unique markings. Orange and White Murano style, hand crafted, colorful Angel Fish art glass sculpture. These Tropical fish sculptures have solid orange and white swaths of color within a sparkling clear glass base. Each piece is hand made with unique markings. 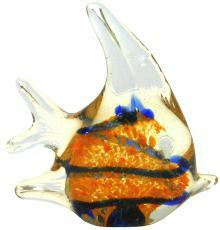 Orange and Blue Stripe Murano style, hand crafted, colorful Angel Fish art glass sculpture. These Tropical fish sculptures have solid orange, blue and white swaths of color within a sparkling clear glass base. Each piece is hand made with unique markings.